Ambassador Yahaya Kwande, a close associate of the Presidential candidate of the Peoples Democratic Party (PDP), Alhaji Atiku Abubakar, has urged the ex-Vice President to toes the path of honour by congratulating President Muhammadu Buhari over his ‘victory’ in the Saturday’s Presidential election. Although, INEC is yet to make any official declaration, but Buhari is said to be leading with over 4 million votes in the results so far announced. Kwande, who is also the Grand Patron, Wazirin of Adamawa Solidarity Vanguard, gave this advice in a statement made available to DAILY POST Tuesday evening. Kwande, who insisted that he has been a long associate of the PDP candidate, declared that the results so far released have shown that Nigerians have elected Buhari for another four years, hence, Abubakar should do the needful by making a call and congratulate the newly elected President. The elder statesman, who recalled with nostalgia how the then incumbent President, Dr. Goodluck Jonathan made a call to congratulate Buhari in 2015 when he discovered that Buhari was the one winning, maintained that Atiku Abubakar should emulate the good gesture of Jonathan. 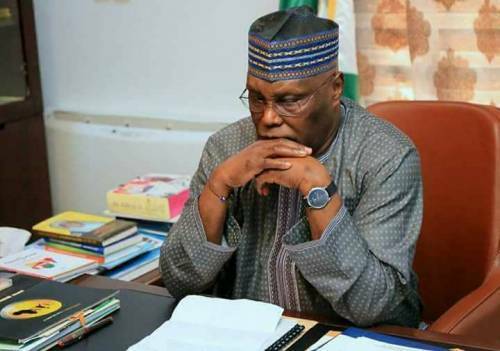 Kwande in the statement entitled, “Alhaji Atiku Abubakar please make that phone call now”, said, “Results so far announced from Saturday’s Presidential Election have confirmed the choice made by Nigerians. “They have resoundingly elected President Muhammadu Buhari of the All Progressives Congress (APC) as the winner of the election. “Even though I am a long time friend and associate of his closest rival, His Excellency Alhaji Atiku Abubakar of the People’s Democratic Party (PDP), I heartily congratulate President Buhari for his win and the confidence Nigerians reposed in him by asking him to serve another four years in office. “By the same token, I call on my friend, associate and brother, Alhaji Atiku Abubakar to pick up his phone and make the call to congratulate the President-elect. “It is imperative that he toes the path of honour and do the needful to save the country of any conflagration. Our recent history under former President Goodluck Jonathan proved that this simple act has the full potential to keep Nigeria peaceful. “The atmosphere has become unnecessarily tense as those who failed Atiku politically continue to give his party and supporters false hope even in the face of a harsh reality. Only the Wazirin of Adamawa has the capacity to defuse this unhealthy tension and save this country from any implosion as some overzealous persons are waiting to make a mockery of our democratic process and further shatter the bonds of unity that holds our country together. “I implore again that Alhaji Atiku Abubakar makes that call before the enemies of Nigeria exploit his delay to do the unthinkable. “In the meantime, I call on President Buhari to be magnanimous in victory by ordering his supporters to desist from making derisive and derogatory comments that could provoke supporters of his opponents who are still trying to process their losses at the polls. May God bless Nigeria”.